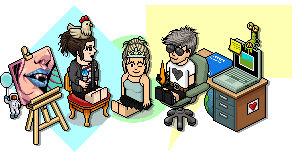 A massive thank you to @BFarnsey; for donating a Throne, Typewriter, Dragon Egg and 100 credits as prizes for the Events Department Habbo History 101 quest! A huge thank you to @lesbon for donating 50 credits to the Competitions Department! A big thank you to UndeadDevilHD and KrazyBethw for donating various items to Habbox. I'd like to thank the lovely @Ms.Aquamarine; for donating 5 credits and various furni items to the Events Department! Thanks to UndeadDevilHD for donating 6 Habbo credits and 1 HC light. Thank you to @David for donating 100 credits and @!:random!:! for donating 15 credits to the Competitions Department. A big thank you to the following people for donating a range of Habbo furniture & credits to the Events Department for Christmas & New Year Giveaways. Thanks to @Sinsinaty; for donating 5 credits and a bunch of Christmas furni! Thanks to @despect for donating 300c and various furniture items to HabboxLive!